As you'll soon discover, though, not everyone is sold on the magic. One of these holdouts is self-proclaimed know-it-all and licensed tour guide Shawnacy, who casts doubt on the theory and doesn't offer much assistance. Don't be disheartened though, press on collecting items and meeting the island inhabitants and maybe you will have the chance to hear the giant potato statue speak! 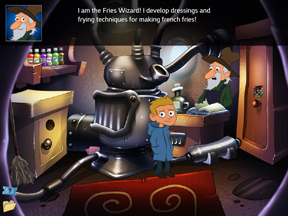 A short but charming game, this conforms to the usual point-and-click genre Carmel often dabbles in. Move your cursor across the screen and click when it changes to interact with people or objects, and click on one then an object to combine or use them on each other. Sometimes, you will have to look around and backtrack to ascertain codes and solve puzzles before you can progress. The game may be short, but as usual the colorful artwork and little twist at the end make it an entraining way to fill ten or fifteen minutes. A walkthrough for the game, in case you get stuck. Note: The order of many steps is interchangeable - you may need to do some backtracking to find the item you need or the solution for a specific puzzle. Go left twice and inspect the stone by the door to find a key. Inspect the treasure chest. The codes are given in pairs for the area and perimeter of the shapes. The correct combination is 5 and 12. Open it to find a quarter. Use the key on the door to open it and find the Fries Wizard inside. Pick up the pink note and broom. Inspect the puzzle on the cabinet and change the element to yellow color and the number 4. Pick up the disc and talk to the wizard about his lost research. Exit, use the broom on the tree, and pick up the paper that falls. Grab the tongs from the trunk of the tree. Head back inside. The wizard gives a Yellow Note in exchange for the paper. Note the order and click the shelf near the top-left, then rearrange the bottles in that order by color. Retrieve the charcoal from the cabinet that opens below. Exit, move one scene to the right, and enter Spuds ‘n’ Suds. Buy a potato by talking to the shopkeeper and give him your quarter. Use the disc on the table, and note the painting citing Cornelius Pennypacker born in 1903. Inspect the table and note 1903 corresponds to ENWS. Grab the aluminum foil under the table. Exit Spuds ‘n’ Suds and enter the code ENWS into the locker in the side to obtain the lighter fluid. Move to the right and open the safe using the pink code. Spin the locker clockwise (CW) past 5, counterclockwise (CCW) past 3, CW past 7, and finally CCW past 1. Obtain the matches. Move to the left back to the scene with Spuds ‘n’ Suds. In sequence, use the charcoal, lighter fluid, and then matches on the grill. Use the aluminum foil on the potato, put it on the grill, and remove it with the tongs. Remove it and obtain a baked potato. Go to the right by the docks and use the baked potato on the statue to complete the game!